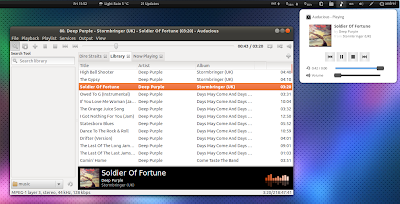 Audacious is a highly configurable music player for GNOME that has a very low memory footprint and comes with many plugins as well as two interfaces: a GTK and a Winamp2-like interface (it also supports Winamp 2 skins). Audacious 3.2 beta has been released recently, featuring a new music library plugin which lets you search your whole music collection and easily create playlists. The new beta also finally adds partial MPRIS v2 support which allows Audacious to integrate with the Ubuntu Sound Menu or GNOME Shell (via extensions like GNOME Shell Mediaplayer). The playlists created under Audacious 3.2 are not supported by older Audacious versions so once you install it, if you go back to older Audacious versions you won't be able to use any newly created playlists! The new MPRIS plugin should be enabled by default (if somehow it's not, go to File > Preferences > Plugins > General and enable the "MPRIS 2 Server" plugin) - this plugin is required if you want Audacious to show up in the Ubuntu Sound Menu / GNOME Shell mediaplayer extensions. The new search tool plugin is not enabled by default, so to enable it, go to File > Preferences > Plugins > General and enable the "Search Tool" plugin. ~/.local/share/gnome-shell/extensions/mediaplayer@patapon.info and add "audacious" under the "players" list. This is not required if you've installed the extension from the WebUpd8 GNOME3 PPA. 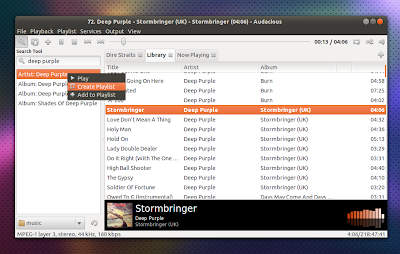 For other Linux distributions and Windows, see the Audacious download page.